Bluegrass Legends Jim & Jesse are celebrating 50 Years as members of the Grand Ole Opry his year. The success of their 60’s radio shows prompted Martha White Flour to bring them to Nashville to star on their early morning show on WSM. In 1964 a life time dream came true for Jim & Jesse when they became regular members of the Grand Ole Opry. Originally released in 1978 as a 2 record set on the Old Dominion label, Radio Shows will be released on 4th March, on Rural Rhythm Records. 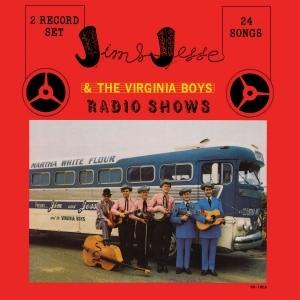 Radio Shows was recorded in 1962 and contained mainly songs never before recorded by Jim & Jesse and The Virginia Boys, and were selected because of the heavy requests for them on their radio shows. Produced by Jesse McReynolds and Gordon Reid, Radio Shows contains 24 songs on one compact disc remastered from the original master tapes with performances by Jim & Jesse McReynolds, Allen Shelton, Jim Buchanan, Don McHan and David Southerland. A special added value feature to the album includes online access to a Jesse McReynolds video interview reminiscing about the RADIO SHOWS album and era, as well as, exclusive photos from his private collection during this wonderful period in the lives of Jim & Jesse. Radio Shows is now available to D.J.’s on AirPlay Direct. Growing up in the mountains of southwest Virginia, radio was a big part of everyone’s lives, other than the live music that was played in their homes… When our oldest sister, Virginia, got married to Oakley Greear (a locally renowned fiddle player), they were the first ones in our mountain community of Carfax to have a radio. And on Saturday nights, Virginia & Oakley would have plenty of company coming to their house to listen to the Grand Ole Opry. Listening to people like Roy Acuff, Bill Monroe, Uncle Dave Macon, and all those Opry stars really had an influence on our urge to want to play music. After a lot of practice and help, and encouragement, from our brother-in-law Oakley, we finally got our first radio show on our local radio station WNVA, Norton, Virginia, in 1947. We soon learned that radio was the answer to getting people to hear your music. I’m just happy that after 50 years you will get to hear how radio shows were done 50 years ago. During this time, we were doing (4) TV shows a week live, in addition to these radio shows. So we were staying pretty busy keeping up with all the new songs and playing a lot of personal appearances throughout the south – Jesse McReynolds. Many of the songs on this project were never recorded by Jim & Jesse. Appearing with Jim and Jesse are Allen Shelton on banjo, Jimmy Buchanan on fiddle, Don McHan on guitar, and Dave Southerland on bass. 9. HAVE YOU LOST YOUR LOVE FOR ME? Jim & Jesse recorded and released many albums on the Old Dominion label dating back to the early 70’s including “The Jim & Jesse Show”, “Superior Sounds Of Bluegrass”, “Jesus Is The Key”, “Jim & Jesse Show Live In Japan”, “Songs About Our Country”, “Palace Of Song”, “Songs of Inspiration” and more. Deep in the mountains of southwest Virginia still stands the white aging farmhouse Jim & Jesse first called home. Raised in the small community of Carfax, located near Coeburn, VA, the boys grew up in a family steeped in traditional mountain music. Their harmony was exceptional, a rarity some say only brothers can produce. Jim’s enhanced high tenor combined with Jesse’s deep lead and unique mandolin style set this duo apart in the world of traditional music, now termed Bluegrass. Very early in their career, Jesse developed a “McReynolds style” technique on the mandolin, combining his invention of “crosspicking and split-string playing”, which distinguished his picking from others. Many have imitated, but few have successfully mastered his unique style of fast execution of intricate melodic patterns. 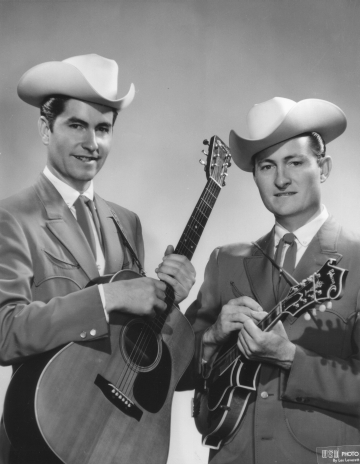 In 1952, Jim & Jesse debuted on their first major label, Capitol Records. Since that time, they have recorded for various labels including: Columbia, Epic, again for Capitol, Opryland, CMH, Rounder, and their own, Old Dominion. In 1960, their first single for Columbia, “The Flame of Love” backed by “Gosh I Miss You All The Time” spent weeks climbing the top 100 national charts. “Cotton Mill Man”, “Diesel On My Tail”, “Are You Missing Me”, and “Paradise” are a few songs regarded as Jim & Jesse classics. They were backed by their band, The Virginia Boys, always top-notch musicians featuring various traditional acoustic instruments: guitar (Jim), mandolin (Jesse), five-string banjo, fiddle and bass. During their career they had toured all 50 states with the exception of Alaska, and have traveled worldwide including: Canada, Mexico, Japan, Europe, The British Isles, and Africa in 1985, for the U.S. State Department. In the late ’50’s and early ’60’s, most of their live weekly radio and television shows throughout the southeast, were sponsored by Martha White Mills. Martha White also sponsored a portion of The Grand Ole Opry, and invited Jim & Jesse as guest hosts. This led to their membership on March 2, 1964 and their move to Gallatin, TN, near Nashville, in 1964. Their numerous honors include induction into the Country Music Hall of Fame’s “Walkway of Stars”, the Virginia Country Music Hall of Fame, IBMA’s Hall of Honor, and Bill Monroe’s Bluegrass Hall of Fame. Individually and collectively they garnered many Grammy nominations. They also received the National Heritage Fellowship Award from the National Endowment for the Arts, presented by Hillary Rodham Clinton and Jane Alexander at the The White House, September 23, 1997. This is our nation’s most prestigious honor in folk and traditional arts. The year 2002 was a difficult one for Jim and Jesse. Both brothers were diagnosed with different types of cancer. Jesse’s battle was successful, Jim’s was not. He passed away on December 31, 2002, ending the longest active professional brother duet in country music history – 55 years. Jesse has carried on the Jim & Jesse tradition and has since gone on to play throughout the world with the Virginia Boys. And the beautiful music that originated from the brothers in the mountains of southwest Virginia back in 1947 is as timeless as ever.